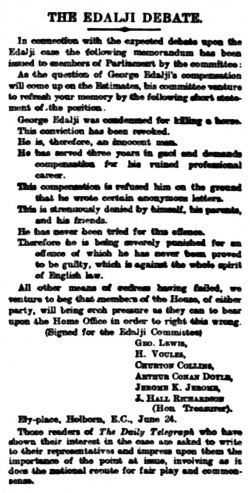 The Edalji Debate is a letter co-written by Arthur Conan Doyle published in The Daily Telegraph on 25 june 1907. As the question of George Edalji's compensation will come up on the Estimates, his committee venture to refresh your memory by the following short statement of the position. George Edalji was condemned for killing a horse. This conviction has been revoked. He is, therefore, an innocent man. He has served three years in gaol and demands compensation for his ruined professional career. This compensation is refused him on the ground that he wrote certain anonymous letters. This is strenuously denied by himself, his parents, and his friends. He has never been tried for the offence. Therefore he is being severely punished for an offence of which he has never been proved to be guilty, which is against the whole spirit of English law. All other means of redress having failed, we venture to beg that members of the House, of either party, will bring such pressure as they can to bear upon the Home Office in order to right this wrong. Those readers of The Daily Telegraph who have shown their interest in the case are asked to write to their representatives and impress upon them the importance of the point at issue, involving as it does the national repute for fair play and common-sense. This page was last edited on 3 October 2017, at 22:24.